Yes, and color outside the line.. oops. Were there any lines? I have a box of them on my desk. I color whenever the mood strikes. Love coloring and drawing! Sometimes there is no better therapy! Sometimes we need to let the inner child, the non-expert, loose in the world to create. What colours are included in our rainbows? This is very nice, thanks for sharing. this is so true…what are you? OK now I want to color. I need a nice big coloring book. Loved this post and your drawing. And sometimes life it its own wonderful fairytale. . . This is good advice. I think to many times we are caught up on how we should live our lives based on how others live theirs- as noted in the rainbow I draw is just like everyone else’s. But you are correct. 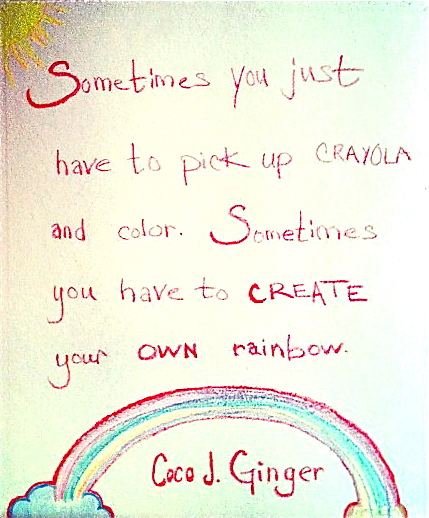 Sometimes we just need to take a crayon without looking and start making our own rainbow and our own path in life! This belongs on my 5 year old daughter’s wall. Better inspiration than princesses and fairy tales. Thanks. You are currently reading Crayola at Coco J. Ginger Says.